Chameleon PACs represent a new breed of environmentally hardened, modular, high-performance distributed controllers designed to enable sophisticated process and logic control to survive in harsh environments. It promotes the migration of control to the field, enabling significant savings in field wiring and installation cost. Distribution of control increases control availability by reducing the risk of control system failure often associated with large central control systems. This unique next-generation hybrid controller is MIL-SPEC qualified out-of-the box. It can be mounted virtually anywhere, eliminating the need for costly enclosures and qualification testing. As such, it significantly reduces the size and weight of the control package. Chameleon PACs are currently installed on 30 U.S. Navy ships in an array of mission-critical applications. Chameleon embraces open architecture and distribution of control. Various network interface modules are available to support widely-used industrial communication protocols such as Modbus, Modbus/TCP, Ethernet/IP, PROFIBUS DP, LonTalk, OPC and Custom ASCII/Binary. 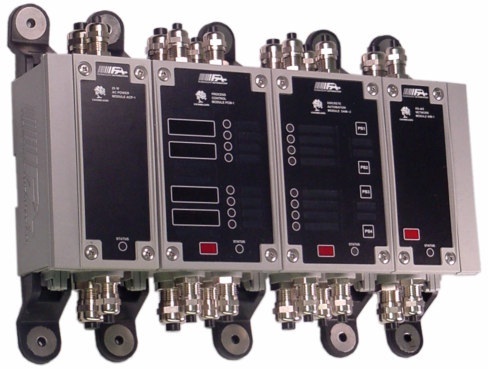 The flexibility of the Chameleon platform allow configuration as a remote I/O drop, as a local controller for an OEM skid (with connectivity to a higher-level supervisory control system), or as a decentralized and highly-survivable ship-wide machinery control and monitoring system (MCMS). Using Chameleon for a ship-wide MCMS solution can drastically reduce cabling runs and thereby significantly reduce installation costs and simplify designs and drawings. Chameleon cost-effectively enables a higher degree of control system distribution, with more controllers and I/O drops located closer to associated control elements. Chameleon devices are configured with Fairmount Automation’s Design Pad G3 software package. Design Pad G3 provides an intuitive graphical programming environment to implement sophisticated control algorithms and automation schemes. It includes familiar function block programming capabilities as well as powerful event-driven state-transition diagramming techniques. New features in Design Pad allow design engineers to define operational states, to specify how the device should behave in each state, and to define events that cause transitions from one state to another. Using these features inherently leads to more robust designs by forcing the segregation of automation tasks into manageable subsystems. Engineers can then focus the design effort on the specific functionality required by each subsystem without the distraction of the system at large. Design Pad projects are also self-documenting since the state diagrams and function block interconnections represent the control specification. Chameleon PAC modules offer a variety of on-board self-diagnostic capabilities. Included is the unique ability for analog outputs to monitor the connection to actuators for loss of signal and unexpected impedance changes. All diagnostic information is available to the programmer to facilitate status transmission over a network and initiate automatic switchover and/or automatic reduced-capability operating mode. Chameleon modules can log any number of user-selected signals at user-configured time-intervals. They can record data continuously (loop recorder mode) or for “snapshots” triggered by user-defined events or conditions. In snapshot mode, modules can record signals both before and after the triggering event occurs. Data can subsequently be retrieved for analysis over a wireless link or network interface. The Chameleon PAC is capable of operating in the most difficult shipboard environments. They are designed to endure high-impact shock, extreme vibration, and electrical power spikes. They can operate over an extended temperature range and are fully submersible. Chameleon is an enclosureless solution: it doesn’t require the use of third-party enclosures for environmental protection. Enclosureless solutions reduce space requirements and equipment weight, and eliminate the added costs associated with enclosure design, fabrication, and assembly. Chameleon was designed with an emphasis on ease of assembly, installation, and maintenance. Several mounting alternatives are available, including panel or surface mounting (directly bolted to a bulk-head or machinery skid), standard DIN-RAIL mounting, or optional high-performance mounting for improved shock and vibration isolation. © Fairmount Automation All rights reserved.